Concise details on the Hiking in Provence tour can be obtained by downloading the tour pdf [right]. Alternatively, read the tour description below and click through the sub-headings in the right-hand column for information on access, accommodation, availability, content and prices. iking in Provence finds you enjoying the delights of the magnificent Ardeche Gorge and the picturesque Ceze valley. It’s light hiking along fine bucolic trails, with plenty to discover along the way. 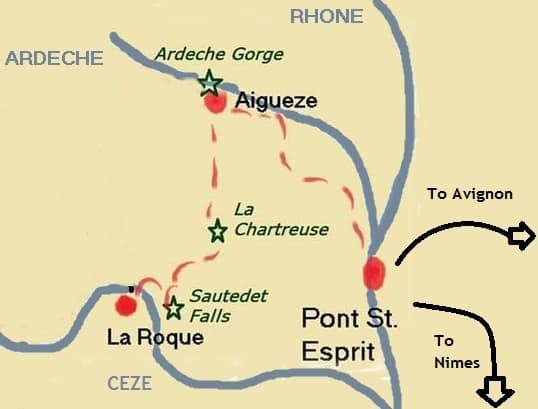 Hiking in Provence starts off in Pont St Esprit, at the confluence of The Rhone and the Ardeche rivers. You move westwards to discover the fruits of the famous gorge before discovering what lies in between – the fabulous forest of Valbonne and the district they call Valcezard in western Provence. Little known and explored by outsiders, it is much loved by the local cognoscenti, and that includes ourselves. Built in the thirteen century, you will enjoy a visit to a magnificent Carthusian monastery. Your accommodation for the tour includes a range of charming, family-run 3-star standard hotels and guest houses, flaunting the stone facades and vaulted ceilings that are so much a part of the fabric of western Provence. Hiking in Provence takes you to hamlets and villages that are either huddled in the bottom of the valley or perched up high on sun-parched limestone hills and gorge cliffs. Either way, you make their acquaintance as part of the ensemble of fascinating insights gained into the life and character of one of Provence’s finest and most understated valleys. We include bed and breakfast so that you can enjoy the local culinary delights in a fashion that is tailored to the requirements of both your budget and diet. The 13th century Chartreuse Carthusian monastery & the impressive Sautadet waterfalls. Stay in superior countryside accommodation. average 9 miles/14.5 kms walking per day. Luggage & people transfers integral to the tour – see itinerary. Not included: remaining meals, entrances to any cultural events or arrival and departure transport. Excellent levels of character and comfort, with outdoor swimming pools in both Auigueze and La Roque. Mix of 3-star standard hotels, residences and chambres d’hotes. Nearest airport or SNCF station is Avignon [3.5 hrs on TGV from Paris or Lille] with onward journey to Pont St Esprit by bus or transfer – please ask for details. Next-best access is via Nimes airport or SNCF station [4 hrs on TGV from Paris or Lille] with onward journey to Pont St Esprit by bus or transfer – please ask for details. Hiking in Provence – Tour Itinerary. Day 1: Arrival at Pont St Esprit and check in. Early arrivals can enjoy a short urban hike around this busy town located at the confluence of the Ardeche and Rhone rivers. Night in Pont St Esprit. You start your week hiking The GR4 as it wends its way along the right bank of the Ardeche and up to the remarkable village of Aigueze, as if hewn out of the sides of the gorge itself. A charming bucolic hike as you meander through the Valbonne forest en route to the impressive site of the Carthusian monastery. Enjoy its majestic aura, take the free tour of the site, and perhaps a short botanical walk around its perimeter. We collect and transfer you to La Roque. Transfer to La Chartreuse after breakfast. You discover the fascinating Sautadet ‘waterfalls’ en route to the imposing hilltop village of Roque. ‘Flaneur’ through its ‘ruelles’ and imbibe its rich ambiance. Second night in La Roque-sur-Ceze. Day 5: Departure day – breakfast and onward journey by taxi. Thanks for choosing to walk our Hiking in Provence trip. 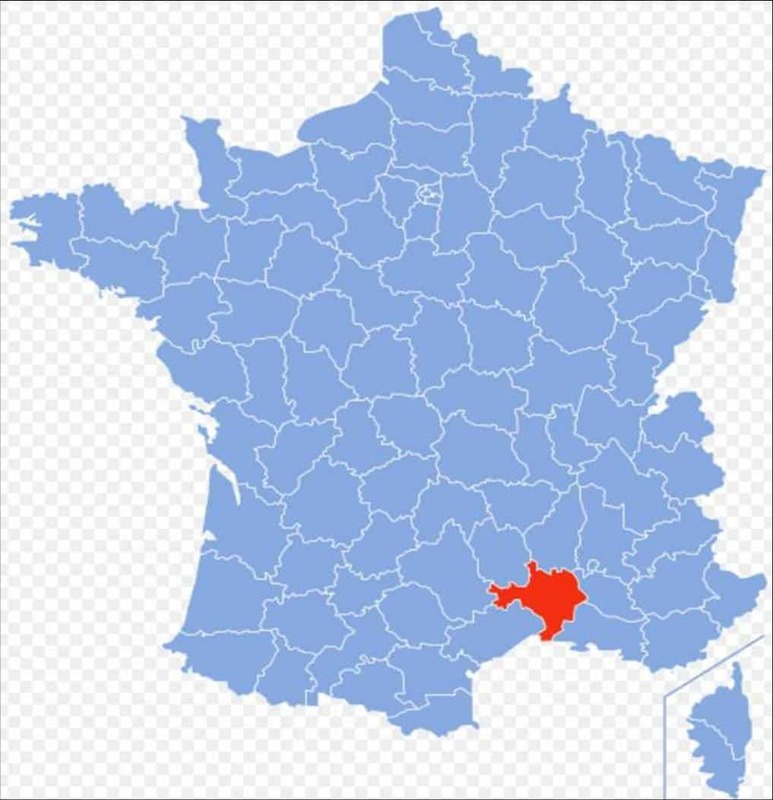 Bon retour et a la prochain!